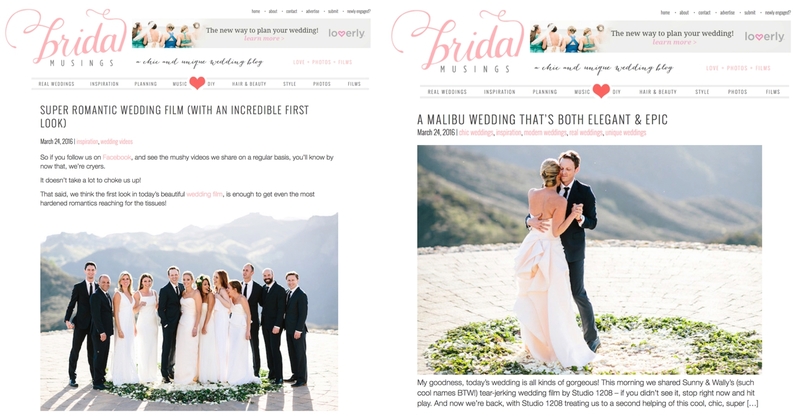 We are so excited to have this gorgeous wedding featured not once, but twice today on Bridal Musings, our favourite wedding blog! Sunny and Wally were married on a gorgeous day in Malibu, California at one of the most epic venues we know of, Malibu Rocky Oaks. Located at the top of, well, a mountain in Malibu Canyon, you get a 360 degree view of the entire canyon and more from the property, and the helipad that the ceremony took place on! No joke, it is next level! We loved shooting this wedding - obviously the location was stunning, but these two, and their people made it over the top amazing...not to mention Sunny's Monique Lhuillier dress made my jaw drop! To see the full features, click HERE for the film, and HERE for the photos. Special thanks to my second shooter, Sherri of Sherri J Photography, and to Berlanti from The Elegant Ninja for helping make this day go so perfectly. Congratulations first of all for getting featured. This seems out to be a very beautiful wedding as the couple is looking very beautiful with each other. They are making a nice pair and it is lovely to watch them like this. I just attended a wedding here and despite my absolutely strict taste, I had an amazing experience here and I thought to myself that this place is perfect! The food at NYC wedding venues is delicious and the ambiance is elegant. Really a amazing mountain wedding. Both of you looking gorgeous and fabulous.